Babies activities become essential when you are changing their diapers or clothes or are not closely around to amuse them. It is also important to keep your baby busy and distracted yet safe while you are working around the house or taking a bath and can not constantly keep an eye on your bub. Since there is not much the newborn babies can do, using attractive and harmless toys with catchy vibrant colors always keeps them happy. The most important thing is the baby's safety and wellbeing. All babies activities must be safe and captivating for the baby. The Activities And Amusement toys prove extremely helpful during long journeys to keep the baby from being easily bored. Another great source of your baby's sensory development are Musical Toys. 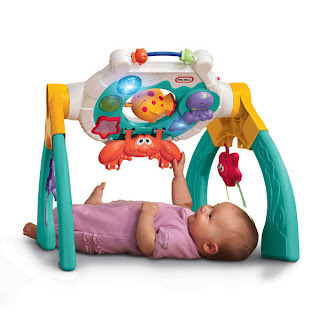 These toys produce different sounds or play music when pushed at certain areas. Babies just love to play with them and learn to interact and respond. These toys also help the little ones recognize different sounds and noises. Desi Toys And Inflatable Toys are ideal source of babies activities and are available in many different levels of complexity to cater for different age groups. Their vibrant colors, attractive patterns and sounds not only amuse babies but also help in developing their sensory and tactical skills.